Kitchen and bath cabinet styles are on display at Bay Tile Kitchen & Bath. 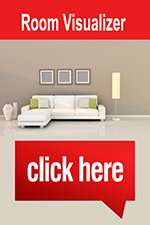 Let us help you select the best cabinets for your kitchen or bath project. Serving Clearwater, FL. Cabinets are the cornerstone of any kitchen and bath remodeling project. Often, particularly in a kitchen, cabinets make up the bulk of the project's budget, so it's important to select cabinets you'll be happy with for many years to come. Oak cabinets. Perhaps the most popular wood for kitchen or bath cabinets, oak is strong, durable, and available in a large variety of colors. Cherry cabinets. 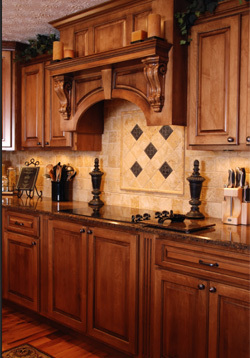 Known for its light and fine patterns, nothing beats the luxurious elegance of cherry wood cabinets. Hickory cabinets. People choose hickory cabinets for their unique open-grained look and large variety of colors. Birch cabinets. Varying in color from creamy yellow reddish brown, birch wood is a good pick for kitchen or bath cabinets. Maple cabinets. Often selected for use in contemporary designs, maple is simple and clean. Rustic maple, characterized by varying sized knots and color throughout the wood, is gaining in popularity as well. Laminate cabinets. For a modern and sleek look, laminate cabinets are an inexpensive and low-maintenance choice for kitchen or bath cabinets. Kitchen and bath cabinets are available in a variety of types, ranging from inexpensive stock cabinets to high-end custom cabinets. Stock cabinets are the most affordable cabinet option. They are available in a variety of colors, finishes and styles, but are only available in the most common sizes. Custom kitchen or bath cabinets, on the other hand, are built to your exact specifications and measurements and the design options are nearly endless. There are options between stock and custom as well. Semi-custom cabinets, for example, allow for some customization within certain parameters and using particular styles, making them both affordable and designer-friendly. Cabinets also come in different styles based on their construction. Traditional framed cabinets have a frame around the cabinet opening, and the cabinet door attaches to the frame. A more contemporary style is the frameless cabinet in which the door attaches directly to the side of the cabinet. With frameless cabinets, there is open access to the interior cabinet, creating more convenience and usability. The perfect cabinet hardware can enhance the look of your cabinets and help you bring other design themes or elements in your home into the kitchen or bathroom. Pulls, knobs and handles for cabinets come in hundreds of different designs, colors, and styles. Shop at Bay Tile Kitchen & Bath in Clearwater, FL to view many samples of kitchen and bath cabinets. As a local business, we're committed to your satisfaction and provide exceptional customer service before, during, and after your purchase. We're looking forward to helping you find the best kitchen and bath cabinets for your home improvement project.